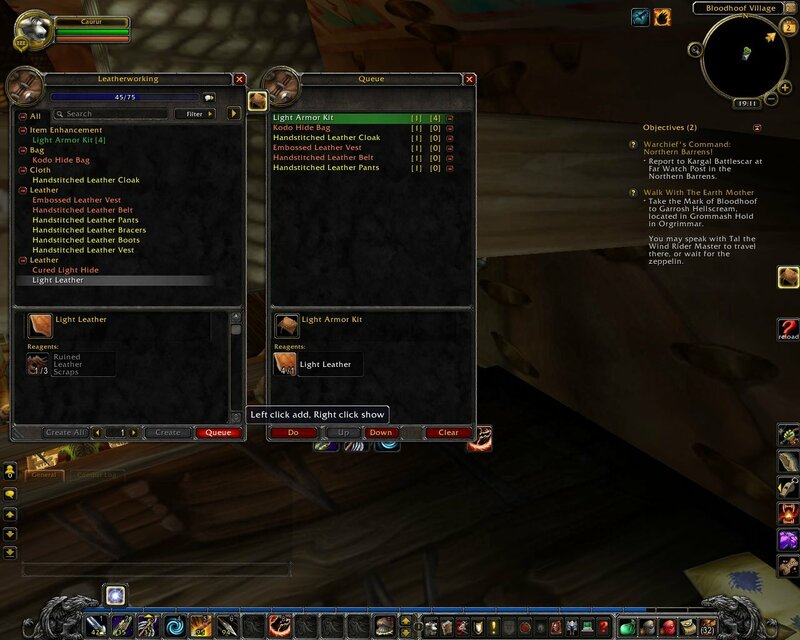 Lightweight tradeskill double wide (and since v1.10 single window mode) window with profession's tabs. 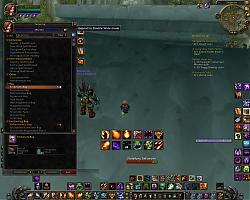 Reuses original Blizzard functionality, as result no lags like in some other addons. Recipe list from 8 to 40 items (easy configurable). "Jobber" like tabs for fast profession switching. Based on ideas from "DoubleWideTradeSkills" and "Jobber". 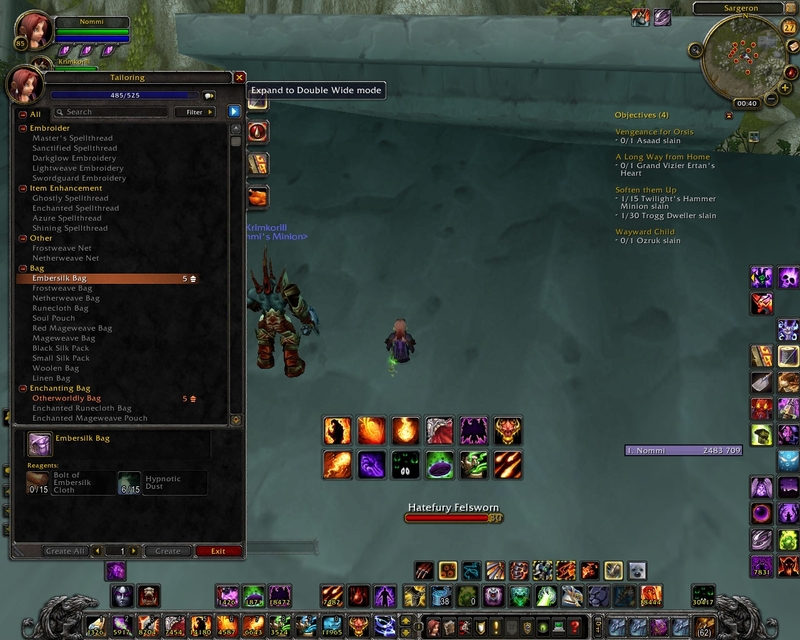 "/tsdw movable" to trigger window "movable"
Compatible with both MoP and 4.3.
slash command to trigger window "movable"
"Destruction" buttons added: "Basic Campfire", "Disenchant", "Prospecting", "Milling"
Skill tabs moved to top right. 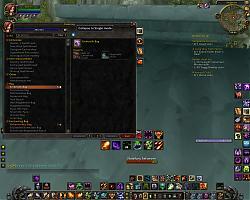 List items count now adjustable through window resizing (button in left-bottom corner). 2 view modes supported: single and double wide. With it disabled, it looks fine. I've been using your addon alongside MayronUI for a while now, and haven't had any problems until recently. The tradeskill window is all over the place (scroll bars out of place, buttons missing, text overflowing outside the window, to name a few), if it is the only window open. If I open a second window (ie the character spellbook) the problem fixes itself. I've made Mayron aware of this issue too, and as the two addons work correctly when running independently of each other, there seems to be a compatibility issue between the two being used together. Any suggestions would be great if anything can be done from your end. When I attempt to queue an item I don't have enough vendor reagents for yet, it queues an entirely different item. Specifically, I tried to queue 10 Rustic Workman's Shirt with no yellow dyes in my bags, and it kept queueing 10 Hyjal Expedition Bags. Probably you queue it while tradeskill list is filtered. Why can I move the main tradeskills window with either MoveAnything or using the 'movable' argument, but cannot move that queue window that pops up? Annoying. And when I mouse over it with MoveAnything, it doesn't even recognize the 'queue' window as something movable. EDIT: Nevermind - I was able to move it via MoveAnything's 'safe frame' option. I think both windows should be able to move via the 'movable' argument, though. Maybe they do and MA messed it up? Dunno. Last edited by vikkyne : 12-22-14 at 02:44 PM. 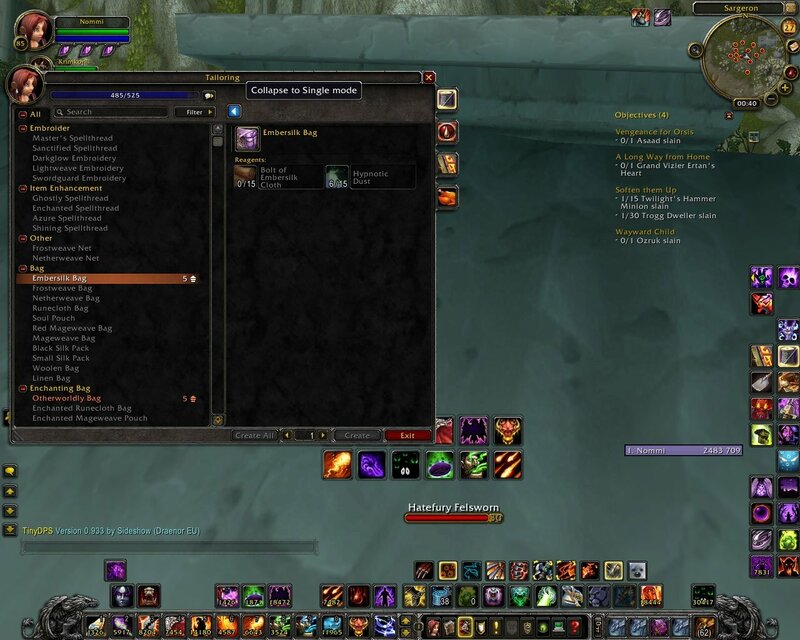 The "AddonSkins" addon for ElvUI was causing the error with TradeskillDW. The author has released a fix and it works now! I had to revert you bug fix suggestions though as two bug fixes for one problem does not work. tsdw.lua is simple text file and you can change it in any text editor (I prefer Notepad++). I'll upload changed probably later. Thx for your help! I will try that code. I always get this error as soon as i open may tradeskill window. Any other tradeskill addons installed? Very strange error. But I can't reproduce it. 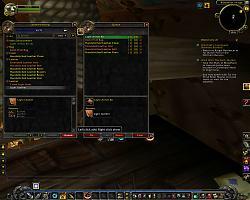 TradeSkillSkill11NumSkillUps is part of Blizzard TradeSkill UI. Error probably on Blizzard's side. TradeSkillDW simply shows more lines as is.